For Ann Taylor Outlet Stores and discount designer Factory Outlets all over America, scroll down to the links below to view a detailed list. This page features a detailed list of factory outlet malls in Texas. The state of Texas is home to 38 factory outlet malls, with many hundred stores selling all your favorite designer brands. Brazos River Factory Stores in Mineral Wells (Ft. Worth) has 2 discount stores: Bon Worth and Vanity Fair. For details, call 616-396-1808. Broadway Square in Tyler features 68 factory outlet stores. For store hours and other info, call ﻿(903) 561-7055. Cielo Vista in El Paso has 110 factory outlet stores. For a list of stores and more info, call 915-779-7071. Gainesville Outlets in Gainesville has 7 factory outlet stores to visit. For details, call (940) 668-6092. Gateway Shopping Center in Austin features 14 factory outlet stores. For store hours and other info, call ﻿(512) 338-4755. Grand Prairie Premium Outlets in Grand Prairie (near Dallas) has 96 factory outlet stores. For a list of stores and more info, call 972-602-8383. Grapevine Mills in Grapevine (near Irving) has 140 factory outlet stores to visit, including an Ann Taylor Outlet. For details, call (972) 724-4910. Gulfway Plaza at LaMarque near Texas City has 6 discount stores to choose from. Call the mall at 409-938-3333. Houston Premium Outlets in Cypress (near Houston) features 135 factory outlet stores, including an Ann Taylor Outlet. For store hours and other info, call ﻿(281) 304-5820. Ingram Park Mall in San Antonio has 108 factory outlet stores. For a list of stores and more info, call 210-523-1228. Katy Mills in Katy (near Houston) has 54 factory outlet stores to visit. For details, call (281) 644-5015. Lakeline Mall, Lakeline Plaza, and Lakeline Village in Cedar Park, near Round Rock, has 140 discount stores to choose from. For a mall map, a list of stores, and other information, call 512-257-8500. Longview Mall in Longview has 52 factory outlet stores. For store hours and other info, call ﻿(903) 753-4453. Midland Park Mall in Midland has 62 factory stores. For a list of stores and more info, call 432-694-1664. North East Mall in Hurst (near Irving) has 116 factory outlet stores. For a list of stores and more info, call 817-589-9603. 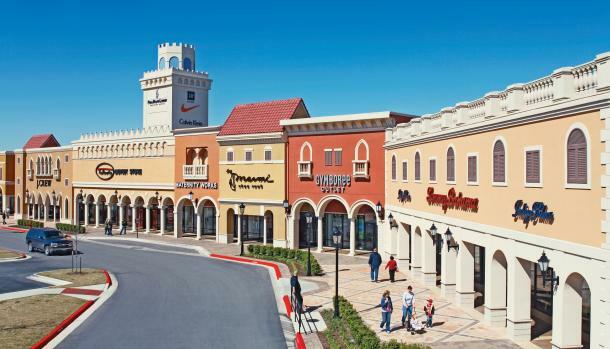 Outlets at Conroe has 18 factory outlet stores to visit. For details, call (936) 756-0904. Outlets at Hillsboro (Near Fort Worth) has 25 discount stores to choose from. For a mall map, a list of stores, and other information, call 254-582-9205. Palms Crossing in McAllen features 21 factory outlet stores. For store hours and other info, call ﻿(956) 972-5454. Richardson Square in Richardson has 5 factory outlet stores. For a list of stores and more info, call 972-675-1041. Rio Grande Valley Premium Outlets in Mercedes (near McAllen) has 126 factory outlet stores to visit. For details, call 956-565-3900. Rolling Oaks Mall in San Antonio has 59 discount stores to choose from. For a list of stores and other information, call the office at 210-651-5601. Round Rock Premium Outlets in Round Rock (near Austin) features 109 factory outlet stores. For store hours and other info, call ﻿(512) 863-6688. San Marcos Premium Outlets in San Marcos has 123 factory outlet stores. For a list of stores and more info, call 512-396-2200. San Marcos Tanger Outlets in San Marcos has 94 factory outlet stores. For details, call 512-396-7446. Shops at Bella Terra in Fort Bend County (near Houston) has 16 discount stores to choose from. For a list of stores and other information, call the office at 713-444-5555. Sunland Park Mall in El Paso features 64 factory outlet stores. For store hours and other info, call ﻿(915) 833-5596. Terrell Tanger Outlets in Terrell (near Dallas) has 33 factory outlet stores. For a list of stores and more info, call 972-524-6034. The Outlet Shoppes at El Paso has 69 factory outlet stores to visit. For details, call 915-877-3208. The Shops at Arbor Walk in Austin has 16 discount stores to choose from. For a list of stores and other information, call the office at 512-338-4755. The Shops at Park Lane in Dallas features 13 factory outlet stores. For store hours and other info, call ﻿(214) 365-0222. University Park Village in Ft. Worth has 22 factory outlet stores. For a list of stores and more info, call 817-332-5700. Valle Vista Mall in Harlingen has 41 factory outlet stores. For details, call 956-425-8392. Wolf Ranch Town Center in Georgetown (near Round Rock) has 36 discount stores to choose from. For a list of stores and other information, call the office at 512-930-8008.